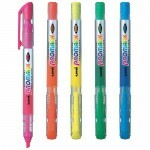 0.7mm Set fo 12 assorted coloursCompletely opaque poster colour marker. Water based, quick drying pigment, non-toxic..
0.9-1.3mm Set of 12 assorted coloursCompletely opaque poster colour marker. Water based, quick drying pigment, non-toxic..
1.8-2.5mm set of 12 assorted coloursCompletely opaque poster colour marker. 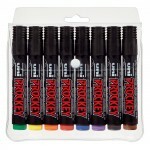 Water based, quick drying pigment, non-toxic..
8.0mm Set of 12 assorted colours.Completely opaque poster colour marker. 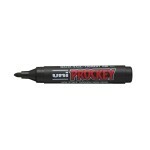 Water based, quick drying pigment, non-toxic..
Uni-Ball Jetstream Pen SX210 ea. Jetstream rollerball ink provides ultra-smooth writing with a quick drying ink.Modern stylish design, ideal for left-handed writers.BALL 1.0mm dia. tungsten carbide ball TIP Stainless Steel BARREL Plastic (PC) & elastic rubber INK Acid free new ..
Uni-Ball Jetstream Rollerball Pen SX-210 doz. Jetstream rollerball ink provides ultra-smooth writing with a quick drying ink.Modern stylish design, ideal for left-handed writers. . BALL 1.0mm dia. tungsten carbide ball TIP Stainless Steel BARREL Plastic (PC) & elastic rubber I..
Uni-Ball Laknock Retractable Pen SN100 doz. Ballpoint pen with new technology 'free flow' ink. Smooth click mechanism and a comfortable rubber grip. Barrel is made from 70% recycled materials. . BALL 0.7mm dia. tungsten carbide ball. TIP Stainless steel. BARREL Polystyrene & TPE grip. 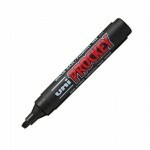 INK ..
Uni-Ball Laknock Retractable Pen SN100 ea. BALL 0.7mm dia. tungsten carbide ball. TIP Stainless steel. BARREL Polystyrene & TPE grip. INK COLOUR 3 colours (Black, Blue, Red). 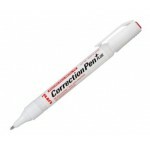 INK REFILL SA-7C..
Uni-Ball Finepoint Pen UB100 doz. BALL 0.7mm dia. tungsten carbide ball. TIP Brass. 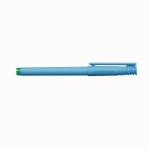 BARREL Plastic (PC) Matte pastel blue. INK Water-based dyestuff ink. INK REFILL N/A. 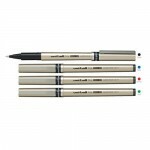 INK COLOUR 4 Colours Black Blue Green Red..
Uni-Ball Finepoint Pen UB100 ea. BALL 0.7mm dia. tungsten carbide ball. TIP Brass. BARREL Plastic (PC) Matte pastel blue. INK Water-based dyestuff ink. INK REFILL N/A. 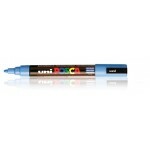 INK COLOUR 4 Colours Black Blue Green Red..
Uni-Ball Fine Deluxe Pen UB177 ea. BALL 0.7mm dia. tungsten carbide ball. TIP Stainless Steel. BARREL Plastic (PP) Champagne gold. INK Water-based pigment ink. INK REFILL N/A. 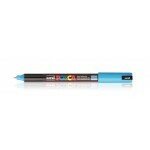 INK COLOUR 3 Colours black blue red..
Uni-Ball Fine Deluxe Pen UB177 doz. BALL 0.7mm dia. tungsten carbide ball. TIP Stainless Steel. BARREL Plastic (PP) Champagne gold. INK Water-based pigment ink. INK REFILL N/A. 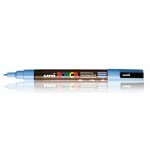 INK COLOUR 3 Colours black blue red..
Uni-Ball Jetstream Pen UB101 doz. This rollerball pen offers premium liquid ink and a black barrel with strong metal clip. Quick drying ink prevents smudging. Ink colour indicated by tip and dot on cap. 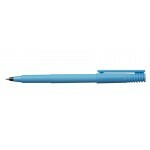 ..
Uni-Ball Jetstream Pen UB101 ea. This rollerball pen offers premium liquid ink and a black barrel with strong metal clip. Quick drying ink prevents smudging. Ink colour indicated by tip and dot on cap. ..